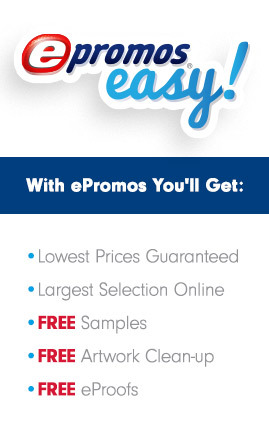 ePromos doesn’t require you to upload files and move them around on the screen. We want you to spend your time finding just the right product for your needs. We’ll handle the artwork for you – just send us the files by email or a hardcopy by mail. Our skilled graphic artists will catch unforeseen problems, make recommendations, and review your artwork and lay it out for you on an eProof. If you don’t have artwork, it’s not a problem. Sketch out or send us a file describing what you’re looking for and we’ll help you out. We will do simple typesetting of your name and message at no charge! If you need artwork created or you need your existing artwork re-created in a usable format, our in-house art department can do it for you.